Okay, they usually aren't that extreme, but you know what I mean. We should be celebrating anyone who wants to better themselves. Like, as a society, this should be our goal. So because I believe this personally, I am no more judgmental of someone who sets a New Year's resolution than I am of a baby taking her first little wobbly steps in the world. I mean, hell, we've all got to start somewhere! Still, perhaps the cynicism surrounding New Year's resolutions lies within our collective knowledge that starting stuff is just hard. Honestly, that's simply a given truth about being a person. I remember whenever I was a kid, there wasn't a single first day of school in which I didn't come home totally exhausted, open up a package of Dunk-a-roos, and just cry silently to myself over the newness of it all while unknowingly spreading chocolate all over my face. Transitions are tough. Beginnings can be brutal. 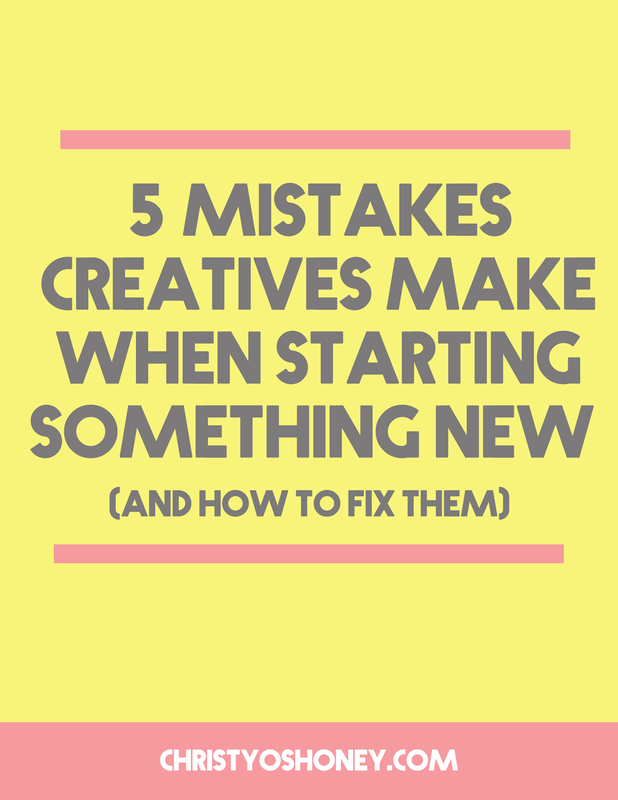 And especially, when it comes to starting something creative -- perhaps a new creative endeavor, a book, a blog, a photography series, etc. -- it's hard to feel confident about those initial first few steps when there is so much uncertainty about the future. 1. We've got "hungry eyes." Is this a common expression or is it just one that my mom made up? She used to say it a lot to me, especially whenever our family would go to eat dinner at a buffet. As a kid, being at a buffet would essentially cause me to lose my goddamn mind. I would look around the room with its vast array of culinary options, and I would return to the table with everything: pork chops, fried chicken, peel-and-eat shrimp, an ice cream sundae, mashed potatoes, a breakfast burrito, a giant sweet tea, and, like, six rolls. "You've got hungry eyes," my mom would say. "You're never going to be able to finish all that." And dammit, she was right. Not only would I not finish my meal, but I'd get so stuffed that I would end up throwing up whatever I ate. Charming story, I know. Anyway, the exact same thing happens in our creative pursuits. We start a project PSYCHED, overjoyed by the sheer freedom of it all, and we immediately take on too much at once. Pretty soon, we collapse from the pressure. Solution: Think smaller. I mean, your dreams should be big, so big that they scare the crap out of you. But the steps to achieving your dreams should be manageable. Instead of saying, "I'm going to write the next great American novel," why not just slow your roll and instead say, "I'm going to write one page a day." Or one paragraph a day. Or one sentence. Who cares?! Create short assignments that will breed confidence into your life, not massive projects that put you on a guilt trip. 2. We lose hope too quickly. We encounter a roadblock and suddenly find ourselves in the throws of despair. We realize that the things we are creating aren't the polished masterpieces that we want them to be. We forget about the entire concept of drafting entirely, and we throw in the towel in order to save face. Solution: Creative blocks are an inevitable, normal part of the process. You're simply not going to be ideating and making your best work 24/7. That said, it's important to battle the assumption that creative work is somehow glamorous because it is NOT. It can be rewarding, yes, but more often that not, it's arduous and painstaking. But in my experience, the best stuff comes after pushing through the worst stuff. 3. We try to do it alone. We see our creative projects as solitary endeavors, so we don't invite anyone in. There is no accountability, no encouragement, no support. We are just islands in a sea of apathy and Netflix. Solution: Grab some humans. Not just any humans -- humans you trust. And tell them what you're working on. Or better yet, work with them on something amazing. When an investor puts money into a fledgling business, they don't do it for the hell of it. They do it because they believe in the company, and they believe there will be a sizable return. The same is true in our creative lives. When we invest time and even money into our projects, we are making a statement that our creative work is worth something, that it will yield valuable results. And of course, the opposite is true whenever we don't invest. 5. We have no plan. We think, "Meh, I'll just wing it." We change nothing about our daily routines and we assume that things will just somehow work out. Of course, the creative process should be a time for freedom and flexibility, but without some semblance of structure, without habits in place, things can easily fall apart. Solution: Before you jump headfirst into a creative project, it's essential to have a creative plan in place. Think through what working on your project will mean for your day-to-day. What will it look like to invest time in your project? Make a plan for that. What will it look like to pursue your creative endeavor habitually? Make a plan for that. Who will be checking in with you? Make a plan for that. Think ahead to any potential pitfalls, and then make a plan to leapfrog over those pitfalls like they are no big deal. How do you ensure success when starting something new?